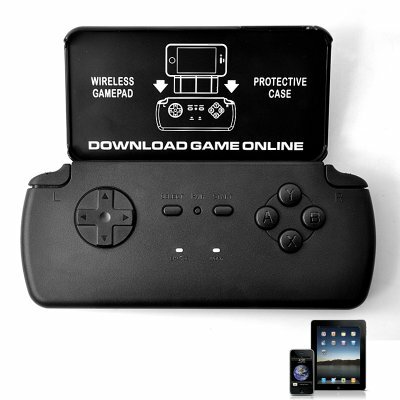 Successfully Added Bluetooth Gamepad for iPhone and iPad to your Shopping Cart. Turn your iOS device into a real gaming rig with the use of this Bluetooth Game Pad. 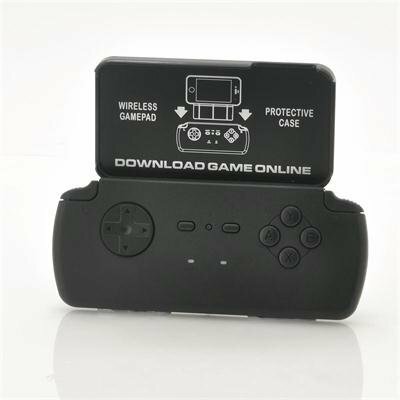 Connect your iPhone or iPad to this Bluetooth game controller for the ultimate gaming experience for your retro and even not so retro games! The Game Pad has 4 action keys, L1 and R1 Keys, Start and Select buttons and a 360 degree control pad, offering all the action buttons you need to play emulated games on your iOS device. The Bluetooth Gamepad is also compatible with iCade supported games meaning you have iCade games this bluetooth game pad will work right out of the box. Click your iPhone 4 or 4s in the holder and slide the holder into the Gamepad for comfortable handheld gaming. Or pair your iPhone 5 or iPad through Bluetooth and use the controller without the holder. The 200mAh battery has enough juice to power the controller up to 24 hours! Beat your previous high scores easily with the new Bluetooth Gamepad! Available now at a low wholesale price and ready to ship out immediately! Brought to you by the leader in electronic gadgets, Chinavasion! "iPhone" and "iPad" a trademark of Apple Inc., registered in the U.S. and other countries. This is not claimed to be an authorized or branded product by Apple Inc., although it is compatible. This product and our company are not affiliated with Apple Inc. or endorsed by them in any way.